How to Find the Perfect Fit? By the time you are ready to replace your old wheelchair, you know exactly what you dislike about your current chair, and which upgrades you would like for your new one. An interesting and somewhat discouraging estimate says that up to 90 percent of wheelchair users are not properly fitted to their chair. Considering how much time you spend in your chair daily, comfort and function should be top priorities. You want your chair to fit snugly, not too wide, not too short, with good back support and not so tall that you have a hard time getting in or out. The Certhealth.com team is there for you at all times to help you select the right wheelchair to fit your body, and to suit your condition and budget. Whether you need a transport wheelchair or a lighter in weight chair, a solution can be found. Our simple guide to measuring for a perfect fit will help you choose the most suitable wheelchair for your needs. Remember, by choosing the wrong size, you could be dooming yourself to ongoing discomfort, and maybe even additional health problems. 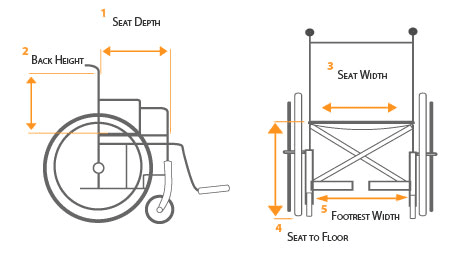 Perhaps the most important measurement is the overall width of the wheelchair and the seat size. folded width of the wheelchair. It must be able to fit into the trunk of your car or your storage space of choice. If you are considering a bariatric-type chair, think of all the obstacles you may face when making turns. The next measurement to consider is seat-to-floor height. If you are not happy with your current wheelchair, try finding one that is right for you by sitting in a basic chair and measuring the seat to arm height. With your arms on the armrests, try to propel the wheelchair. Do the armrests rub? Are they in your way? Seat dimensions are taken from the seat when you are deeply and comfortably seated. Make sure the sides of the seat do not place unwanted pressure on your hips. Then measure the seat depth. Back height is another important measurement. First measure from your hip to the top of your shoulder. This should be the exact back height of your new wheelchair. Back support will determine your upper body range of motion, so be sure the back is not too restrictive, yet still supportive. Other measurements you should be sure of before picking a new chair are back of the seat to the floor, hanger angle and wheel chamber. Check with your current provider for chair weight limits as well. What About All the Extras? Depending on your medical condition and particular needs, you may want to opt for anti-tippers, replacement for rear wheels, oxygen holder or a bag for oxygen cylinder, elevating leg rests and a seat belt. And don’t be afraid to ask questions. At the end of the day, you and you will be the one using the wheelchair, so shop wisely. string(49) "it's really wonderful. device. Maximum comfort!!!"